Secretary of Defense Donald Rumsfeld said Tuesday he hopes military commanders "are telling the truth" when they assure him no more troops are needed in Iraq, but he is willing to boost U.S. forces if top officers recommended it. 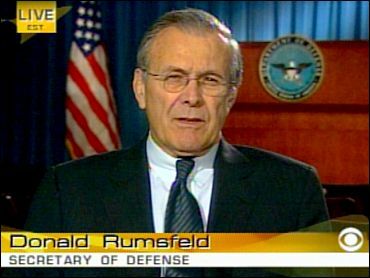 Asked if the United States is doing all it can to win the war, Rumsfeld told the CBS News Early Show "there's no question that that's the case." "We're in a low intensity war that needs to be won and we intend to win it," he said. But he would not say whether he stood by his prewar assertion that Iraq possessed a wide variety of biological and chemical weapons stockpiles and an active nuclear weapons program. The defense secretary spoke as U.S. forces fought through a bloody November in Iraq — a month in which 37 Americans have been killed, bringing the war's total U.S. death toll to at least 389. Efforts by Washington to get more foreign troops on the ground suffered when Turkey announced last week it would not send several thousand soldiers. The U.S. is hoping to rally foreign help to bolster its forces when Army units begin rotating home. Already, the Pentagon has a plan to call up thousands more reservists and deploy Marines for duty in Iraq to replace those departing Army units. The plan will reduce overall troop levels. Following the downing of three U.S. helicopters in two weeks, Rumsfeld said commanders were responsible for making sure defensive measures were in place on helicopters. "The helicopters in the region both the reserve and the guard, as well as the active force copters, are equipped with defense mechanisms, I'm advised, and they vary by type of helicopter, but certainly whatever is needed over there, the Army has an obligation to see that they send over there," he said. "And I know that the senior leadership in the United States Army is doing just that." Rumsfeld said the troop-level question is "one that I ask almost weekly and every single military leader in Iraq answers that question, 'Yes, we do have a sufficient number of U.S. forces.'" "Needless to say, if at any moment the military commanders indicated that they need more U.S. troops, I would certainly recommend it to the president and we would increase the number of troops but the advice we're getting is just the opposite," he said. Rumsfeld noted that the number of Iraqis serving in security forces is rising steadily and may soon exceed the number of U.S. troops on the ground. Asked if U.S. commanders might be sugarcoating their reports, the defense secretary insisted: "What I want to hear is the truth. And I hope they're telling the truth and you believe they're telling the truth and if they're not, they're not serve their country very well because I have no bias one way or the other." "I'm perfectly willing to recommend to the president we increase the number of forces if in fact, that is in the best interest of this country," Rumsfeld said, adding that the numbers of new recruits and re-enlistments have been "very positive" despite the rigors of war. Speaking on Veteran's Day, the Pentagon chief saluted servicemen and women he has visited who were wounded in Afghanistan or Iraq. "They are proud of their service, they understand how important it is to defend the freedom of the United States of America, and their morale is high and we are so fortunate, as a country, to have such wonderful young men and women, soldiers, sailors, airmen, marines, willing to volunteer," Rumsfeld said. CBS News Early Show Co-Host Harry Smith asked Rumsfeld why no weapons of mass destruction had been found in Iraq, despite his own assertion last January that Iraq had "large unaccounted stockpiles of chemical and biological weapons, including mustard gas, anthrax, botulism, possibly smallpox" and "an active program to acquire and develop nuclear weapons." Rumsfeld said the intelligence behind his claims was the same spy data used by the Clinton administration and foreign countries. He said Iraq's declaration to the United Nations that it had no proscribed activities was roundly denounced as fraudulent. But the defense secretary did not say whether he still felt confident that Iraq possessed the illegally weapons he alleged. The Iraq Survey Group is working on this," he said, referring to the 1,400-person weapons hunting team led by David Cay. "They've developed an interim report which suggests a good deal of information and they'll ultimately have a final report and we'll all know."